Haida society continues to produce a robust and highly stylized art form, a leading component of Northwest Coast art. While artists frequently have expressed this in large wooden carvings ( totem poles), Chilkat weaving, or ornate jewellery, in the 21st century, younger people are also making art in popular expression such as Haida manga. Oral histories and archaeological evidence indicate that the Haida have occupied Haida Gwaii for more than 17,000 years. In that time they have established an intimate connection with the islands' lands and oceans, established highly structured societies, and constructed many villages. 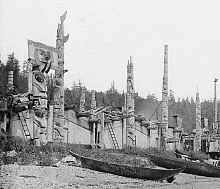 The Haida have also occupied present-day southern Alaska for more than the last 200 years, the modern group having emigrated from Haida Gwaii in the 18th century. Also in 1857, the USS Massachusetts was sent from Seattle to nearby Port Gamble, where indigenous raiding parties made up of Haida (from territory claimed by the British) and Tongass (from territory claimed by the Russians) had been attacking and enslaving the Coast Salish people there. When the Haida and Tongass (sea lion tribe Tlingit) warriors refused to acknowledge American jurisdiction and to hand over those among them who had attacked the Puget Sound communities, a battle ensued in which 26 natives and one government soldier were killed. In the aftermath of this, Colonel Isaac Ebey, a US military officer and the first settler on Whidbey Island, was shot and beheaded on 11 August 1857 by a small Tlingit group from Kake, Alaska, in retaliation for the killing of a respected Kake chief in the raid the year before. Ebey's scalp was purchased from the Kake by an American trader in 1860. The introduction of smallpox among the Haida at Victoria in March 1862 significantly reduced their sovereignty over their traditional territories, and opened the doorway to colonial power. As many as nine in ten Haidas died of smallpox and many villages were completely depopulated. In 1885 the Haida potlatch ( Haida: waahlgahl) was outlawed under the Potlatch Ban. The elimination of the potlatch system destroyed financial relationships and seriously interrupted the cultural heritage of coastal people. The Haida also created "notions of wealth", and Jenness credits them with the introduction of the totem pole (Haida: ǥyaagang) and the bentwood box. Missionaries regarded the carved poles as graven images rather than representations of the family histories that wove Haida society together. Chiefly families showed their histories by erecting totems outside their homes, or on house posts forming the building. Their social organization was matrilineal. As the islands were Christianized, many cultural works such as totem posts were destroyed or taken to museums around the world. This significantly undermined Haida self-knowledge and further diminished morale. Prior to contact with Europeans, other Indigenous communities regarded the Haida as aggressive warriors and made attempts to avoid sea battles with them. Archeological evidence shows that Northwest coast tribes, to which the Haida belong, engaged in warfare as early as 10 000 BC. Though the Haida were more likely to participate in sea battles, it was not uncommon for them to engage in hand-to-hand combat or long-range attacks.